A special day for the city of Indianapolis and the state of Indiana, as quarterback Peyton Manning returned for a weekend full of celebration. A recap of Week 5 for the Indianapolis Colts. Many Indianapolis Colts fans had Week 5 circled on their calendars as the most anticipated week of the 2017 NFL season. And it wasn’t because the San Francisco 49ers were in town. On Saturday, the Indianapolis Colts unveiled the statue of legendary quarterback Peyton Manning, a man who meant so much not only to the Colts franchise, but to the city of Indianapolis and the state of Indiana. And at halftime of Sunday’s game, the team immortalized Manning inside the stadium, with a retired #18 and an induction into the Colts ring of honor. And a special treat for fans; one last snap to Manning from Jeff Saturday, hitting Reggie Wayne in the end zone one final time. As for the game itself, the Colts led for the majority before San Francisco was able to tie it up in the waning minutes of the 4th quarter, 23-23. And with the overtime period slowly trickling to an end, and a potential tie-game in sight, the Colts lined up the greatest of all-time, kicker Adam Vinatieri, for a 52-yard boot for the win. 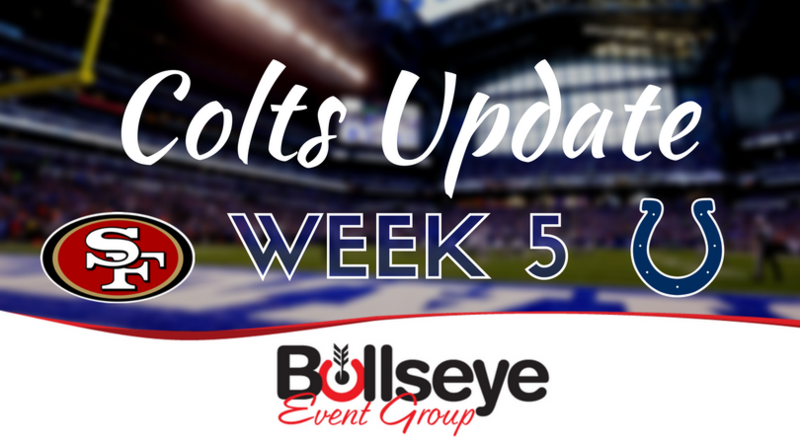 The Colts hit the road in Week 6 for their second primetime game in three weeks, traveling to Nashville, TN for a Monday Night Football showdown with the Tennessee Titans. With quarterback Andrew Luck being ruled out for the Colts, Titans QB Marcus Mariota appears to have his status in question as well with a lingering hamstring injury.